This thoughtful rosary and card set comes with a handcrafted rosary and a sturdy prayer card, both exclusive to The Catholic Company. The rosary features marbled, earth-tone jasper and tiger eye beads, and a brass medal of St. Peregrine, patron saint of those with cancer. A meaningful gift of prayer and healing for anyone who is struggling with the burdens and fears that often come with a serious illness. A neutral design for men or women, perfect for slipping in a pocket or keeping on a bedside table. Front: St. 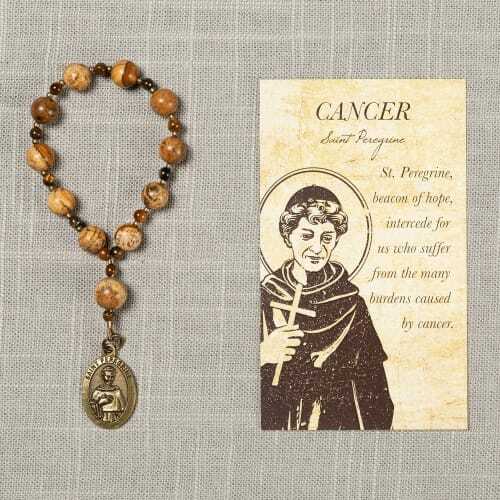 Peregrine, beacon of hope, intercede for us who suffer from the many burdens caused by cancer. Back: "St. Peregrine, I confidently turn to you for help in my present sickness. For so many years you bore in your own flesh this cancerous disease that destroys the very fiber of our being. Ask God to relieve me of this sickness, if it be His Holy Will. But if it should be God’s Holy Will that I bear this sickness, obtain for me courage and strength to accept these trials from the loving hand of God with patience; He knows what is best for the salvation of my soul. I offer my pains to God with all the love of my heart, for His glory and the salvation of souls, especially my own. Amen."